英文摘要：Through the investigation of butterflies in Mount Emei in the summer of 2008-2017, 1 860 butterfly specimens belonging to 154 species, 73 genera and 10 families were collected. Combined with previous reports, we summarized 279 butterfly species belonging to 126 genera and 11 families in Mount Emei. In this survey, the species number (55) and individual number (645) of Nymphalidae are both the highest, while those of Acraeidae are the least. Common species (accounting for more than 5% of the total individual number of butterflies) are Euthalia kardama, Celaenorrhinus maculosus, Pieris canidia, Stibochiona nicea, Faunis aerope and P. melete, and the total individual numbers of which account for 41.10% of the total number of butterflies. Rare species are Troides aeacus, T. helena, Lamproptera curia, Bhutanitis thaidina, Stichophthalma neumogeni, S. louisa, S. howqua, Sasakia funebris, Kallima inachus and Libythea celtis. Longterm monitoring and investigation are suggested to provide basic data for the scientific and rational exploitation of butterfly resources and to protect endangered, rare and endemic butterflies. 胡冰冰, 李后魂, 梁之聘, 等. 2010. 八仙山自然保护区蝶类群落多样性及区系组成[J]. 生态学报, 30(12):3226-3238. 李传隆. 1962. 云南生物考察报告(鳞翅目 锤角亚目)[J]. 昆虫学报, 11(增刊):172-198. 刘晶, 郑发科. 2006. 四川省竹巴龙自然保护区蝶类分布初探[J]. 野生动物学报, 27(5):38-40. 刘文萍, 胡绍安. 1997. 四川省峨眉地区蝶类名录[J]. 西南农业大学学报, 19(5):472-474. 寿建新, 周尧, 李宇飞. 2006. 世界蝴蝶分类名录[M]. 西安:陕西科学技术出版社. 王敏, 范骁凌. 2002. 中国灰蝶志[M]. 郑州:河南科学技术出版社. 武春生. 2001. 中国动物志 第二十五卷 昆虫纲 鳞翅目 凤蝶科[M]. 北京:科学出版社. 武春生. 2010. 中国动物志 第五十二卷 昆虫纲 鳞翅目 粉蝶科[M]. 北京:科学出版社. 谢嗣光, 李树恒, 石福明. 2004. 四川省九寨沟自然保护区蝶类区系组成及多样性[J]. 西南大学学报(自然科学版), 26(5):584-588. 谢嗣光, 李树恒. 2007. 四川省喇叭河自然保护区蝶类垂直分布及多样性研究[J]. 西南大学学报(自然科学版), 29(2):111-117. 姚佳慧, 罗浩然, 杨成聪. 2014. 四川峨眉山生态旅游及其环境保护[J]. 农业与技术, 34(6):180. 袁锋, 袁向群, 薛国喜. 2015. 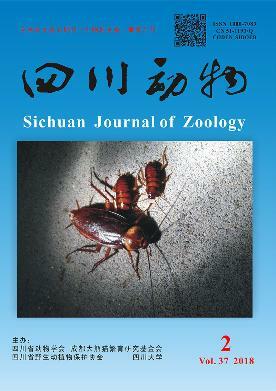 中国动物志 第五十五卷 昆虫纲 鳞翅目 弄蝶科[M]. 北京:科学出版社. 赵力. 1993. 四川西部蝶类资源调查[J]. 四川动物, 12(3):12-14. 周尧, 袁锋, 陈丽轸. 2004. 世界名蝶鉴赏图谱[M]. 郑州:河南科学技术出版社. Kremen C. 1992. Assessing the indicator properties of species assemblages for natural areas monitoring[J]. Ecological Applications, 2:203-217. Maes D, van Dyck H. 2001. Butterfly diversity loss in Flanders (north Belgium):Europe's worst case scenario?[J]. Biological Conservation, 99:263-276. Pateman RM, Hill JK, Roy DB, et al. 2012. Temperature-dependent alterations in host use drive rapid range expansion in a butterfly[J]. Science, 336(6084):1028-1030.